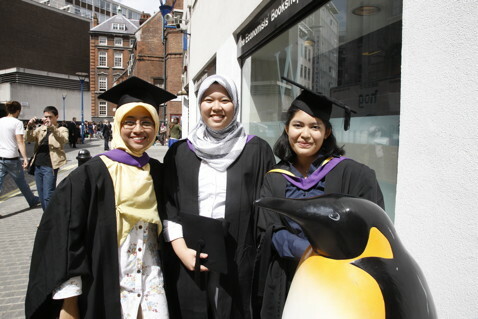 Over the past 11 years the Penguin has become a much loved LSE character, happy to pose in a stream of graduation photographs whatever the London weather. LSE Archivist Sue Donnelly shares the story behind the Penguin. The Penguin, made of aluminium and just over a metre tall, was made by the Canadian sculptor, Yolanda Vandergaast. Vandergaast was born in Ontario, Canada and graduated from the Sculpture/Installation Programme at Ontario College of Art and Design in 1999 specialising in foundry and mould making. Her first penguins appeared in 2000 as Penguins on a Waterfall in the Odette Sculpture Park, Windsor, Ontario. The Penguin appeared on campus in 2005 as one of the Odette sculptures donated by a Canadian alumnus, Louis Odette. Louis Odette came to LSE in October 1945 while still serving in the Canadian forces. Before the war he had spent a year at the University of Toronto studying Commerce and Finance and under the auspices of the Khaki University of Canada applied for the General Course. Odette planned to take courses taught in the second year of the B. Commerce degree. These included economics, business administration, the economics of modern industry, industrial law and accounting. He was admitted to the course by W Arthur Lewis and his referees were two senior Liberal Canadian politicians Norman McLarty, who had been Secretary of State for Canada from 1941 until earlier in 1945, and his replacement Paul Martin. On his return to Canada Louis Odette founded Eastern Construction in 1951.His personal interest in sculpture led to him collaborating in the development of the Toronto Sculpture Garden, the Windsor Sculpture Park in Ontario, and the Centre for Sculpture at York University, Ontario, before donating nine sculptures for the LSE campus. Initially the Penguin roosted outside the Economists’ Bookshop on Clare Market. However in March 2009 disaster struck when the Penguin disappeared leaving only his flippers. Flowers, poems and a tin of sardines were left at the site to try and lure the Penguin home but to no avail. Hopes that it might be returned after a student prank came to nothing. 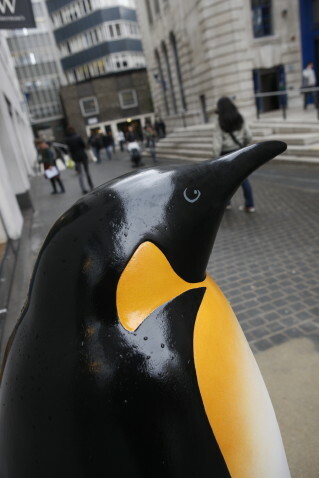 But in October 2009 a replacement Penguin appeared on Clare Market. In 2015 the Penguin migrated to the John Watkins Plaza where he continues his important role in graduation rituals.